On 30 November 2018, BIBB experts met with representatives of VET institutions from Switzerland, Austria, Australia and Canada in a workshop on the comparability of data on in-company vocational education and training to discuss the further development of the existing indicators. Although there is great interest in dual vocational education training in the international education and employment policy debate, there is a lack of indicators for international reporting, in contrast to general education. For this reason, the existing indicators are to be subjected to an international review and further developed as part of a BIBB project. A major challenge lies in selecting the right data and interpreting them correctly against the background of the very different national contexts. Since 2014, BIBB experts have been reporting on developments in in-company vocational training in selected countries from an international comparative perspective in an annual data report. 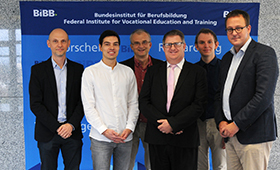 This includes not only developments from countries with dual VET systems (Germany, Austria and Switzerland), but also from countries that have completely different systems, but also a highly developed in-company vocational training system that is integrated into the education system. Examples of this are Australia and Canada. In this context, BIBB also benefits from the country reports from the International Handbook of Vocational Education and Training (IHBB).